Singhania is already out of FMCG entities and Raymond Apparel. Next in line are the two engineering arms. 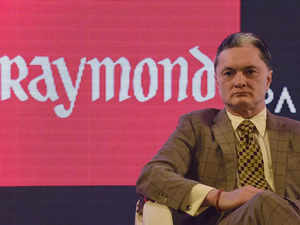 KOLKATA: Raymond Group promoter and chairman Gautam Hari Singhania said he will step down as chairman from all group companies and dissociate himself from day-today functioning to build an organisation which can run competitively and independently without the involvement of the promoter. Singhania said he has already moved out from the chairman’s post for the FMCG entities and Raymond Apparel which handles the branded apparel business. Next in line would be the two engineering entities — JK Files and Ring Plus Aqua — for which he is already looking for a professional chairman, and he may even move out from the top post of the flagship entity, Raymond Ltd.
“At Raymond Ltd, I don’t know how long I will be the chairman. I have something in mind which I don’t want to talk about now. I am not the chairman of all other group companies which are significant,” he said. Singhania said he is creating independent governance for each company and will ensure the promoter family is always away from day-to-day functioning. “Tomorrow morning if I die, god forbid, there are identified people who will take charge of everything. Raymond can run independently and competitively. My children are very young. I have a responsibility to my wife and children, to my employees and shareholders, my banks, institutions and customers," the 53-year-old said. He said that he will rather focus on strategy, new product development, budget, set targets, compensation and public relations for the business. In the FMCG business, Rajeev Bakshi is the chairman of JK Helene Curtis while Singhania is a director and there are three independent directors. Last November, he stepped down as chairman of Raymond Apparel with Nirvik Singh replacing him. The company also inducted two independent directors with Singhania becoming a director. Singhania, who was in Kolkata on Tuesday, told ET that he is ensuring that Raymond Group is moving forward to a highly transparent governance structure. “How many family managed companies are there in India where the promoter steps down at a young age as the chairman of the company? That’s where the problem lies,” he said. Touching on the issues about his estranged father Vijaypat Singhania, he said his father has "hundreds of crores with him”, and insisted that he will be “indebted to anyone for life” who can manage to bring his father to stay with him. Vijaypat was removed from the chairman emeritus post at Raymond Group last October. Singhania senior has alleged that after he gifted his son Gautam his 37% stake worth Rs 1,000 crore, he was also denied the duplex in the re-developed JK House in tony South Mumbai, and is now living as a poor man. The son said anybody who thinks I have kicked my father out is wrong. “I have offered him several times to come and stay with me. He is my father, and is 81years old. If I am not going to take care of him, then who will? Several people tried to intervene and get him stay with me, but they failed,” he said. He said he will be happy to sort out the issues with his father across the table. “But don’t ask me to do things which are not possible for me to do and are against the law,” he said.